Well maintained, move-in ready 3 bedroom, 2 bath, 2-car garage coach home on first floor awaits the discerning buyer. 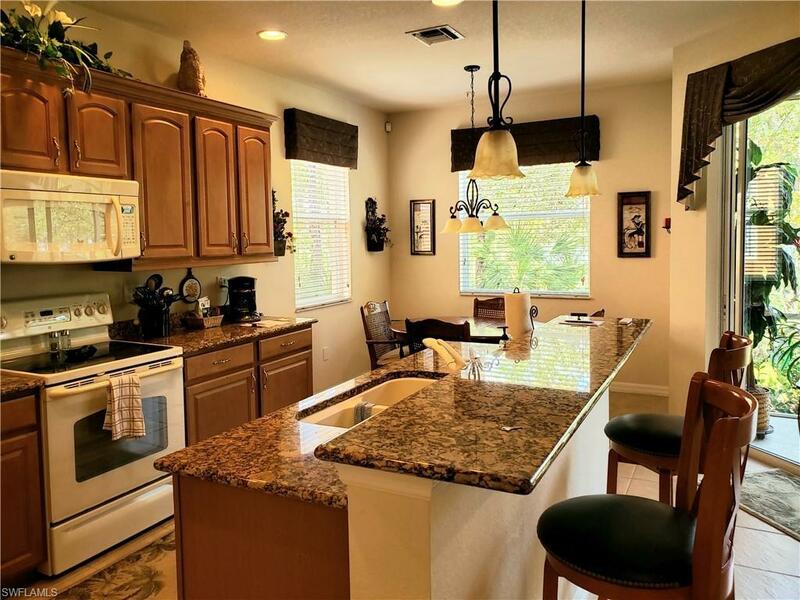 Fully furnished, this home features tile throughout the spacious living area, granite and wood cabinets in the kitchen with under cabinet lighting, and electric hurricane shutters on the lanai. New A/C and garbage disposal installed in 2018, water heater in 2015, and washer in 2015. The view of Lakes Park from the lanai is lovely, overlooking the large lake and wooded area. Reflection Key is a popular gated community which offers a pool, spa, tennis, play area, clubhouse with exercise room, billiards room, and library, and gated access to Lakes Park. Lakes Park offers miles of walking paths, bike and boat rental, butterfly patch, mini train and play areas for children, and a Farmers Market on Wednesday mornings. Conveniently located, Reflection Key is close to the Barbara Mann Performing Arts Center, shopping, restaurants, and the beaches of Sanibel and Fort Myers Beach.